Dr. McEwen is from a small town in Ontario, Canada and graduated with a Bachelor of Science in Animal Biology from the University of Guelph. She went on to receive her D.V.M from the Ontario Veterinary College at the same university in 2018. 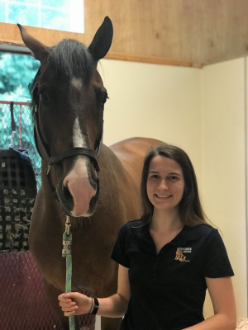 She worked as a veterinary assistant for several years at an equine practice in her hometown, where she developed an interest in reproduction and preventive medicine. Dr. McEwen has a Thoroughbred, Buddy, who is currently enjoying retirement in her hometown. In her spare time, Dr. McEwen enjoys reading, listening to live music, spending time with her cat and fiancé, and is currently planning for her wedding in September of 2019.